The QuickPower8 is a complete security system package that combines hardwired economy and wireless convenience. 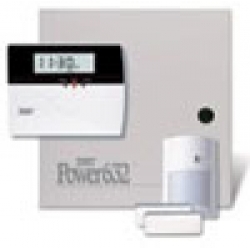 QuickPower8 is an all-in-one hybrid security system kit that offers attractive pricing and reduced installation time. Simply install the control panel, wire the keypad, enroll the wireless devices, and the installation process is complete! The DSC QuickPower8 hybrid kit offers flexibility and support for the full offering of DSC hardwired and 433 MHz wireless sensors and accessories.